Everyone knows that American cars come in all shapes and sizes. But to most people, American motorcycles come in only one form, the Harley-Davidson cruiser. What a great sound. But this seems to leave patriotic bikers who want something a bit more sporting out in the cold. At least it would, if not for a small, Wisconsin-based company called Buell. Their motorcycles are as American as apple pie, but are not so much cruisers, as cruise missiles. 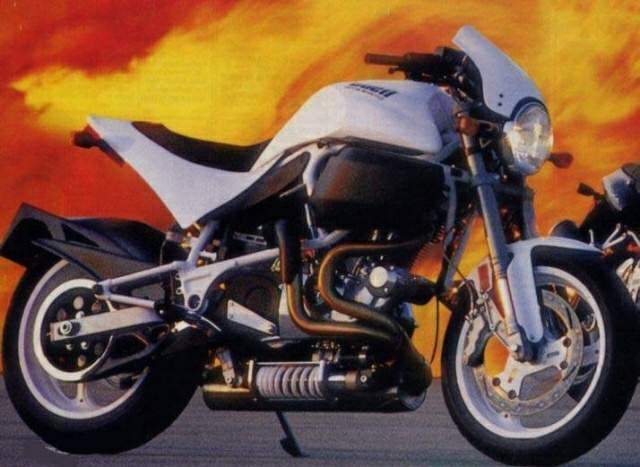 When most riders first encounter the Buell S1 White Lightning, they think it's something radically new. But in reality, it's only the latest of a long line of Harley-Davidson-powered sport machines that former Harley engineer, Erik Buell, has been building since 1987. 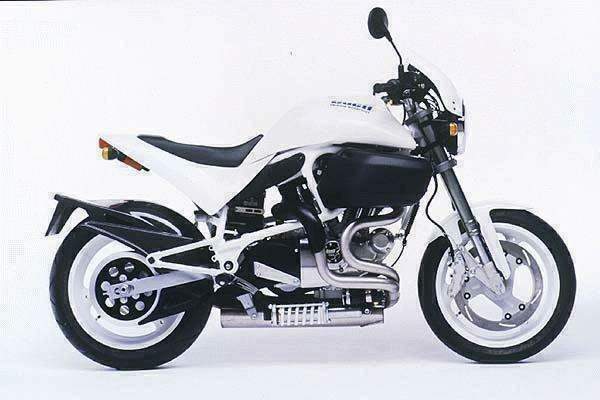 Like its predecessors, and unlike traditional American cruisers, the White Lightning is a pure sport bike, one built following Erik Buell's own unique rules of motorcycle design. And unique, it is! With its hyper-aggressive, junkyard dog styling, it doesn't look like anything else on the road. 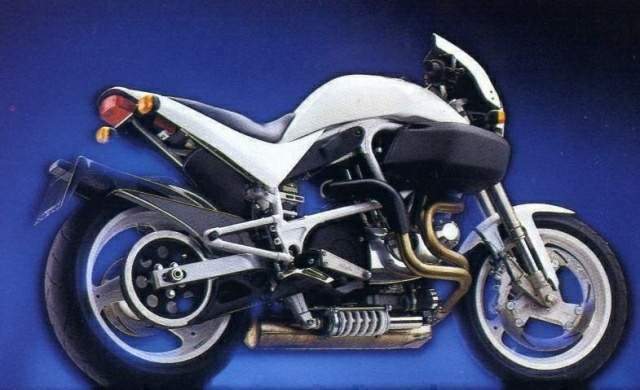 But rather than distract, its unique lines draw your eyes to the Buell's rather novel components. The frame is familiar chrome-moly tubing, but follows unconventional lines. And uses the engine itself as part of its structure. It rides on a set of trick, race-bred inverted forks up front. And a fully-adjustable, but horizontally-mounted, rear shock that's designed to extend over bumps rather than compress. Primary braking load is carried by a single huge 13.4-inch front disc that's gripped by a six-piston caliper. While the all-American drivetrain delivers power to the fat rear Dunlop, by way of a kevlar-reinforced belt. The air-cooled 1200cc V-twin engine starts life as the same unit found in Harley's 1200 Sportster. But Mr. Buell then adds free flowing heads, a lightened flywheel, recalibrated ignition, and bigger exhaust headers. It inhales through this ungainly-looking, side-mounted airbox. And exhales through a stainless steel exhaust system, notable for the sheer size and efficiency of its muffler, as well as funky details like the inconsistent weld quality and hardware store hose clamps attaching the heat shield. The end result, measured on the dyno at Maryland's Rockville Harley-Davidson, is 80 horsepower and 75.6 pound-feet of torque. A huge increase over stock. This not only means serious, wheely-pulling bottom end, but massive midrange. And the power keeps on coming to a very un-Harley-like 7,000 rpm. These changes do trade away a bit of the old hog's user-friendly feel off idle. But those raised on peaky 4-pot sport bikes will still consider it a stump-puller. Our test bike's 5-speed gearbox shifted poorly on delivery, though a bit of clutch adjustment soon smoothed it out and had the bike eating up fast roads like a rabid greyhound. The suspension is firm, even on its softest settings, but still soaks up bumps at speed. And sticks to the rider's chosen line like a limpet mine. While the short 55-inch wheelbase allows it to turn at a rate light years ahead of its porkier compatriots. And should allow an experienced Buell rider to easily hang with the fastest foreign sport bikes on twisty roads. While the brakes deliver both stand-on-your-nose stopping power and superb lever feel. The riding position is sporty, but comfortable. Perfect for long distances. While the Harley engine's normally prominent vibration is dampened by Buell's effective Uniplanar isolation system. We didn't, however, care much for the narrow, thinly padded seat or the lack of return springs in the foot pegs. The compact windscreen smooths airflow over the rider at high speed and protects a set of costly-looking, white-faced analog gauges, surrounded by an inexpensive-looking cast instrument panel. It's yet another odd clash of crude and classy. The sort of inconsistency that could cause some buyers asked to splash out $10,599 for a White Lightning to think twice. And the sort of detail that Buell must address, if it wishes to expand from niche manufacturer to market powerhouse. A recent agreement with Harley-Davidson, in which the Motor Company bought 49 percent of Buell and agreed to sell Buell motorcycles through Harley dealerships, should help the tiny company reach that goal. But for those willing to live with a few idiosyncracies, the Buell S1 White Lightning offers a unique motorcycling experience. One that will forever change their ideas of what an American motorcycle can be, and blow those old cruiser cobwebs away for good.